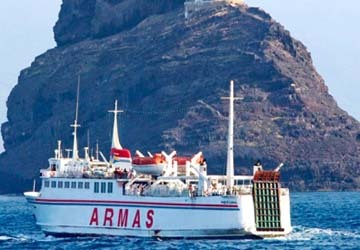 The Los Cristianos San Sebastian de la Gomera ferry route connects Tenerife with La Gomera and is currently operated by 2 ferry companies. The Naviera Armas service runs up to 4 times per day with a sailing duration of around 55 minutes while the Fred Olsen Express service runs up to 3 times per day with a duration from 50 min. So that’s a combined 49 sailings on offer per week on the Los Cristianos San Sebastian de la Gomera route between Tenerife and La Gomera. Compare now and get the best fare at the time that you want to travel. Prices shown represent the average one way price paid by our customers. The most common booking on the Los Cristianos San Sebastian de la Gomera route is a car and 2 passengers. I recommend this, as we found the ferry to be prompt, easy to use, was fun - with an entertainment segment if you went to the back of the ferry, and i must say very good toilets and a clean ship ! We spotted pods of porpoise in the sea, too, so that was a bonus. It was all part of the fun of the holiday and i will remember it as being very enjoyable. The ferry ran on time despite arriving late into the port of San Sebestan on La Gomera and there being a swell at sea. The vessel was comfortable and staff were efficient. 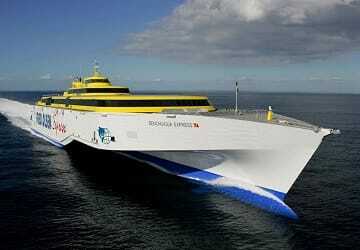 The ferries are efficient, on time, clean and fast. Large luggage can be placed in lockers so its not in your way. "Ferry trip to and from La Gomera"
Very pleasant and comfy sailing.